Almond Cream contains a lot of fat and is healthy for the heart because it abounds in unsaturated fat - the same type of useful fat that is found in olive oil and lowers cholesterol levels and thus reduces the risk of heart disease.It is an excellent source of vitamin E that prevents the oxidation of LDL cholesterol - a process linked to atherosclerosis and thus protects against heart attacks. 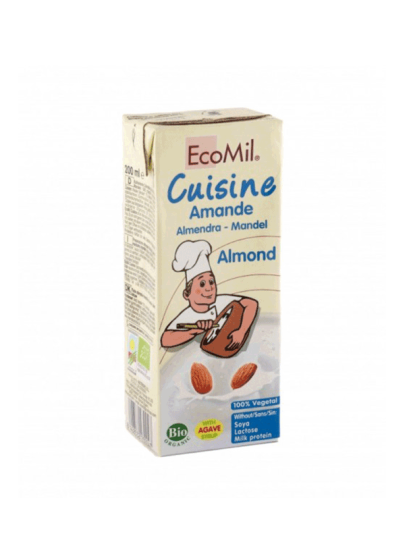 Almonds are also an excellent source of many others for the health of useful nutrients such as magnesium, manganese, copper, phosphorus and calcium, which are important for bone renewal and recovery, antioxidant activity, energy recovery, nerve and endocrine system maintenance, normal blood pressure and for optimal thyroid function. water, almond oil *, almond (7%), agave syrup *, emulsifier: sunflower lecithin, stabilizer: xanthan gum, arabic gum, sea salt, natural aroma of almonds *.